The 13 Best Places to Celebrate St. Patrick’s Day in Missouri! It’s hard to say whether it’s luckier to be Irish, or to be in Missouri. Fortunately, you don’t have to choose between them. These unique Missouri St. Patrick’s Day celebrations shout “Show-Me the Irish” in communities all over the state. Here are our favorite places to celebrate March 17. A group of friends meeting at Hogerty’s Cocktail Lounge in 1973 felt that Kansas City needed a St. Patrick’s Day Parade to better commemorate the area’s Irish heritage. Fast forward 45 years and the Kansas City St. Patrick’s Day Parade is the largest Irish celebration in the area. Groups of volunteers work hard to provide a family-friendly event anyone can attend. This fun neighborhood parade is geared toward families and local businesses, with over 100 organizations marching or riding in vehicles. Look for high school bands, drill teams, Irish step dancers, the Jackson County Sheriff Mounted Patrol, and a variety of dogs. The Brookside St. Patrick’s Warm-Up Parade always falls on the Saturday before St. Patrick’s Day, and kicks off a citywide celebration of Ireland’s patron saint. Thousands of cards are sent every year to the post office in St. Patrick, Missouri, to be “hand-stamped with a pictorial cancellation commemorating St. Patrick’s Day.” St. Patrick is more a hamlet than a town now, but the community does host a locally famous celebration that includes mass at the church (modelled on a church in Ireland), breakfast, lunch, dinner, and lots of Irish music. Cape Girardeau is home to one of Missouri's best pub crawls, an annual event taking in 11 clubs and restaurants. Crawlers have a chance at some prizes for those who complete the crawl, giveaways are limited so be sure to get out there early! The St. Joseph St. Patrick’s Day Parade is organized by the Ancient Order of Hibernians, a nationally-known Irish Catholic men’s group which promotes Irish culture and supports various charitable causes. The Hibernians host a family-friendly parade with plenty of floats and music, well attended by the community and supported by local businesses. Brewers from three states gather in Sikeston every year for the St Patrick's Day Festival and Homebrew Competition. Sample craft beers from commercial and private brewers while enjoying good food and live music. A family-friendly event, prizes are given for the best St. Patrick's Day costume. Crowder State Park, near Trenton, is the site of the family-friendly St. Patrick’s Day Scavenger Hunt. Park rangers offer two scavenger hunt options—one driving, the other hiking. Prizes are awarded to the winners. The University of Missouri at Columbia has hosted this celebration of St. Patrick's Day for close to 120 years. Engineers' Week is eight days of fun, frolic, and Irish-themed festivity in honor of St. Patrick, the patron saint of engineers. Games and road rallies, 5Ks and Scavenger Hunt, there's plenty to do in Columbia the week before St. Patrick's Day. With nearly 100,000 participants, Snake Saturday is the largest Irish festival in North Kansas City and a philanthropic endeavor. The party begins on the Friday before St. Patrick's Day with a charity cook-off for the adults and a carnival for the kids. The next day, Snake Saturday, you'll find plenty of food vendors, a free children's area, children's stage, and the Snake Saturday Parade. After thirty years of charitable giving, Snake Saturday just reached a million-dollar milestone. This annual celebration features a green-and-gold colored parade through historic downtown Kirksville, the Little Miss and Mister Leprechaun Contest, as well as Irish-themed games, a 5K, and live Irish entertainment. Proceeds go to local charities. Just west of the capital in Jefferson City is Paddy Malone’s Irish Pub, home of a small but enthusiastic St. Patrick’s Day parade. 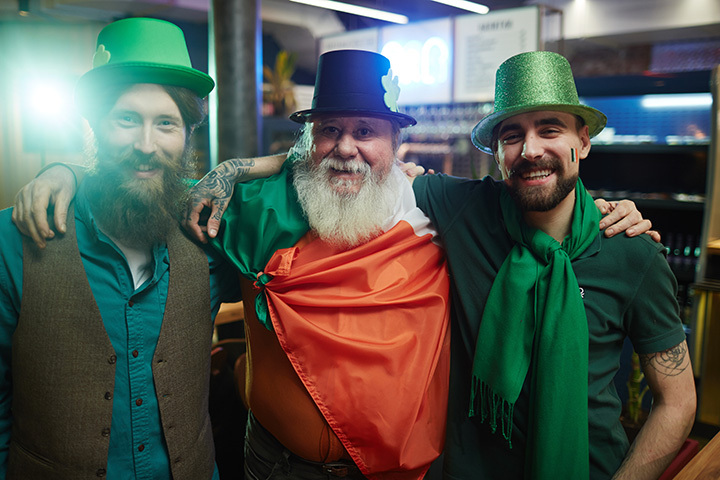 Join the crowd marching through downtown, sharing their proud Irish heritage, and then return to Paddy Malone’s for some corned beef and cabbage, and some good Irish whiskey. St. Louis' annual St. Patrick's Day Parade is actually a two day-long celebration, with something for everyone. The festivities kick off the evening before with a black-tie dinner at the Hilton. Cocktails, visiting dignitaries, and dancing give way the next morning to the St. Patrick's Day Parade Run, one of the largest events of its kind in the St. Louis area, with more than 8,000 participants running the five-mile course through the streets of historic downtown. And then, the world-famous St. Patrick's Day Parade itself, comprised of over 120 marching bands, floats, giant character balloons, and clowns. All in all, this an event for the entire family.